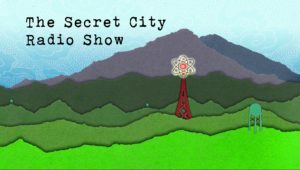 The Secret City Radio Show will showcase the Cumberland Plateau and Clinch River Valley’s rich heritage with performances from musical guests, interviews with historians and local artists, and stories of the latest in innovative science. Featuring live music from Scott Miller. The show will be broadcast from the new American Museum of Science and Energy (AMSE) in Oak Ridge, Tennessee. The Secret City Radio Show will broadcast live on WDVX at 89.9 FM, 102.9 FM in Knoxville and 93.9 FM in Seymour and Kodak, and online at WDVX.com. The Secret City Radio Show is made possible by its title sponsor, ORNL Federal Credit Union and official sponsorship support from UCOR, The East Tennessee Foundation, UT-Battelle, RSI EnTech, and Strata-g, and technical support sponsorship from AMSE and Pellissippi State.